The Drift: A Guide to Surviving a Friendship Breakup, by Lauren Foster, prompted me to look back at former friendships. Her tips for working through the process included: allowing oneself room to mourn, letting go, giving thanks, and finally, forming new friendships. It struck a chord with me, and I wondered if breaking up with friends was as difficult as breaking up with a significant other. Social media allowed me to reconnect with many old friends, meet the man who became Hubby, and find new sets of like-minded people who shared my interests in Zumba, health and weight loss, Nursing and reading. I met my Zumba instructor friends in 2008, at the ZIN (Zumba Instructors Network) Convention, after “speaking” with them on an everyday basis through a networking message board. When we met in person for the first time, it felt like a reunion of long-time friends. We had a wonderful time together and remained connected, through Facebook, even though we are scattered throughout the country. Similarly, I remained connected with new Nursing school friends and old high school and college friends. 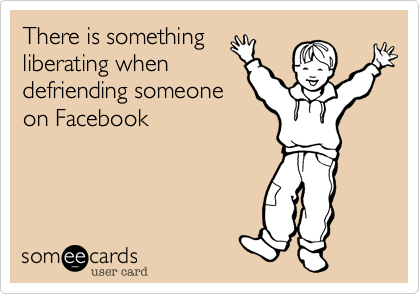 Facebook also brought new people into my life and several acquaintances became friends. Because I craved the one-on-one interaction of looking someone in the eye when speaking with them, I wanted to meet online friends in person. Logistically, that was impossible. Additionally, there was a layer of anonymity and artifice as we could create an online persona different from our own. There was a chance that we were getting a “sanitized for the internet” version of someone’s personality, but I think people’s true colors eventually surfaced the more we got to know each other. Talk to the hand, because the face ain’t listening. Recently, a couple of my online friendships reached a logical end. One was easily dismissed, as she was not someone I felt comfortable confiding in. She was an oversensitive, passive/aggressive person whose feelings were easily hurt. Moreover, her definition of confidentiality and mine were incompatible. Communicating with her was simply tiresome and reminiscent of volatile, hormone-driven Middle School friendships. Peace. Out. The other break up hurt. She and I bonded over mutual experiences and beliefs. Unfortunately, her image of me was influenced by others and she accused me of speaking ill of her behind her back. At the same time she was speaking ill of me. I freely admitted to speaking (er, gossiping…gulp) about her, but my “error” was calling her out for doing the same thing. I developed my own thick skin, but that did not mean that I had not suffered at the hands of Regina George and her ostracizing band of Mean Girls. After reaching out to her a couple of times, it became abundantly clear that she no longer wanted my friendship. I took a relationship break, as it became obvious that I was a”fan friend” there to build her up, rather than a partner in the relationship. I said goodbye privately to the friendship, and mentally moved her to my “cordial acquaintances” list. The pain of losing the connections was similar to breakups I had with men. The drama associated with them, however, was decidedly female. While I didn’t have physical relationships with my female friends, I was still sad to see them leave. Once these friendships ended I immediately felt lighter, as if a weight had been removed from my chest. As I realized I would not be speaking with these people everyday as I had grown accustomed to, I embraced a short grieving period. I found TIME. Time to speak with other online friends, time to spend cleaning up my house, time to read other books, time to watch television, time to work and most importantly, time to spend with my family! It was not only liberating, but empowering and humbling. As those doors closed, others opened. I just needed to allow them the space, take a deep breath and plunge back in. Tell me about your experience breaking up with friends. Was it an ugly breakup or did you just drift away from each other? Did you ever reconnect with the old friends? This entry was posted in Accountability, Change, Food for Thought, Friendship, LIfe and tagged breaking up with friends, celebrating friendship, change, Lauren Foster, moving forward, new friendships, old friendships. Great post! Even though it’s been a long time since I was in school, I have a few friends that constantly pop up in my thoughts. Girlfriends that felt more like my sisters. Sadly, we drifted apart. And I will admit, I have thought about looking for them on Facebook and reconnecting. Trouble with me is, I’m completely inept at navigating Facebook, and I wonder if we would even have the same connections we had decades ago. I’m certainly not the same person I was back then, and I wonder if they are. It’s interesting to reconnect with friends from the past, because you know each other as your past selves. It’s fun to see how someone’s core personality has changed or stayed the same. I found that most people were exactly the same as they were in high school, only to a higher level. The jerks were still jerks and the people who were nice, were still nice. It was great to see people come out of their shells and embrace themselves fully, though. I agree! Facebook has been amazing as far as reconnecting with soooo many people! It’s just been so much fun – and it was the reason I went to my 20 year high school reunion a few summers ago (did I just reveal my age?! *gasp!!*). We had a small graduating class of only 53, so everyone knew everyone and the reunion was a blast because I felt like I already had a connection with so many of them! As far as saying goodbye to friends, they’ve just kind of drifted, but one hurt in particular. It was a friendship I had with an older couple – a generation ahead. I really respected them and their cultural sophistication. I visited their home in Winnipeg, CA, and a few months later I received a letter that told me flat out that they were dissolving our relationship and they didn’t ever want to hear from me again. I was devastated because to this day, I don’t know what I did. We only had one other friend in common, but I would have a very hard time believing that that person turned them against me or made something up about me. That was so so strange, and it bothered me for a long time because it was so over the top extreme. Let’s not talk about “age.” LOL I’m staring my 30 year High School reunion in the face and I’m not ready! It puzzling at how your friends broke up with you, Misty. I usually like letter because letter writing is a dying art, but I would hope they would’ve had enough respect for the relationship you cultivated to speak directly with you. I wonder what they were told, and by whom, to make the decision they did. I, too, would have been devastated. Wow! Great post, Michelle! I’ve always hated breaking up with friends, but sometimes it’s just necessary. My older sister has always told me, “People treat you the way you let ’em.” And it’s so true. I think we all have to tell ourselves that not only do we deserve friends who respect us and are kind to us, but friends who will give as much as they take. It is most definitely a partnership, similar to a marriage in most instances. I’m lucky that I’ve had the same best friend for eighteen years, but I agree that not all friendships are meant for longevity. Partnership! You said it. Alison! That’s what all great friendships have in common. I am so envious of your 18 year relationship with your best friend. I’ve had best friends over the course of my life, but we drift in and out of “best friend” status. My Hubby has a few close friends like that – his best friend in the world, whom he met in 5th grade and has remained closed to for over 40 years and guys in his Army unit, whom Facebook brought back together. Social media has been wonderful for bringing people I never thought i’d hear from again. Sometimes there was a reason why we hadn’t kept up the friendship. Reasons we’d forgotten I suspect. One friend in particular. I’d forgotten who negative she is where everything is a drama. Time is so precious that I made the decision to back away and let the connection die. It’s tough though in a public forum, where people can get nasty, quickly and publicly. True friends, hang with you in the good times and the bad, be it by social media or in person. I’ve made some lovely connections and met some people on FB that I cherish. That would be you my lovely. When I win lotto I’m jetting over and the margaritas are on me. Hayson, my luv and favorite Kiwi in the world! You bring up another great point: those pesky public forums and the potential for ugly comments and bullying. Sometimes, the most difficult people to break up with are those “energy vampires” who thrive on drama and negativity. Once we do, we wonder what took so long, but I think we each have to reach critical mass – the proverbial line in the sand. And, it changes depending on the person and situation. I appreciate whatever spirit or Goddess, brought so many amazing women into my life through the internet. Lottery = check. Margaritas = check. Beach research to check out cute boys for possible book boyfriends = Priceless.